A run doesn’t have to be long or difficult to be interesting. I’d done the Ray Miller 50K the week before, so was looking to do something not too long or strenuous. That didn’t mean it couldn’t be a run with an adventurous edge. 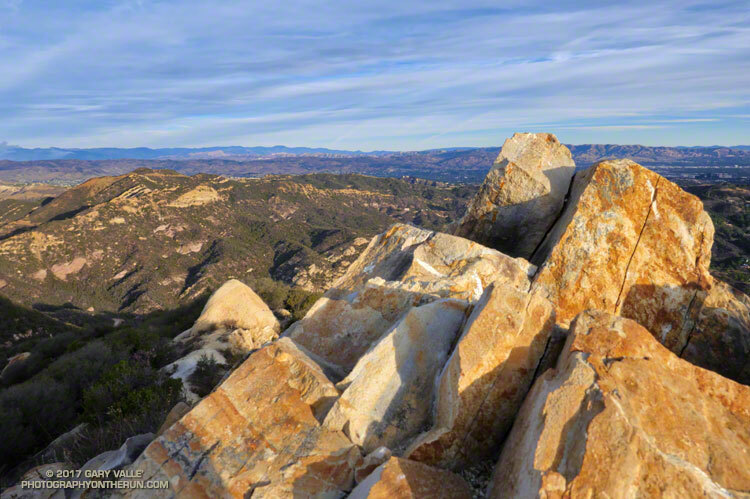 After considering several options, I finally settled on the Topanga Lookout Ridge Loop, plus a short side trip to the summit of Saddle Peak. This 8.5 mile route combines a fun run, hike and scramble up a mile and a half long ridge to the Topanga Lookout with a scenic run on a segment of the Backbone Trail. The return to the Cold Canyon trailhead on Stunt Road is accomplished by descending the Stunt High Trail from its junction with the Backbone Trail. The Backbone Trail climbs to its second highest point near Saddle Peak and it takes only a few minutes to run over to the summit of the peak. Despite rumors to the contrary the West peak (with all the antennae) is the higher peak. That’s where the benchmark is, and 1/9th arc-sec DEM data puts its elevation about 18′ higher than the East peak.